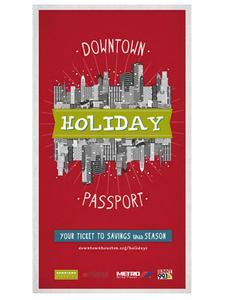 For the holidays, there is a free weekend trolley that goes around downtown Houston. The trolley makes a big loop, stopping at 12 locations. Go HERE for details. Parking is free at the Macy’s parking garage during trolley hours (Friday – Sunday). You can check the schedule HERE. Once you are on the trolley, grab the passport. If you show this at certain downtown restaurants and shops, you receive a discount.